I recently traveled in Wisconsin with a group of people who weren't from here. At every meal cheese was the de facto topic of conversation and we couldn't turn down a cheese plate, order of cheese curds, or whatever entree would send someone with lactose intolerance running for the hills. By the end of the trip I was REALLY craving a salad, but the experience gave me an outside-in look at how the rest of the world views The Dairy State. And while I've frequented my share of cheese caves (seek out the Field to Fork Cafe and Grocery if you are ever in Sheboygan) and stand by the idea that goats are the newest bovine underdog (if you don't believe me, visit LaClare Farms in Malone), my absolute favorite specialty cheese store is the Foster Cheese Haus just off Interstate 94 at Highway HH between Osseo and Eau Claire. 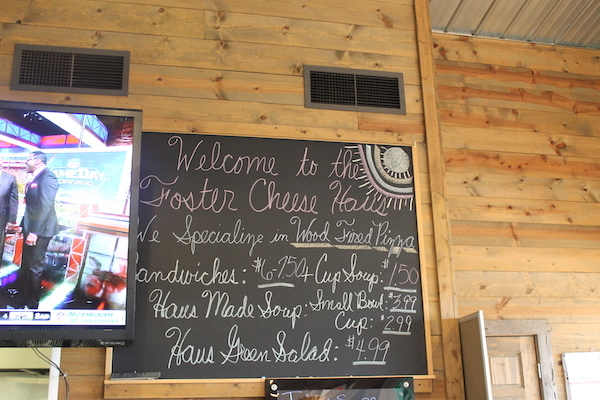 To tell the truth, I first discovered Foster Cheese Haus because I really needed to use the restroom. Impressed by the modern design and the general cleanliness of the ladies room, Foster Cheese Haus is my favorite place to pee between Madison and Minneapolis (and if you've ever made this journey, you'll know this is one stretch of the Wisconsin interstate corridor without a convenient rest area). In recent trips, I've noticed a "restaurant is for customers only" sign, which further supports my case with the Wisconsin Department of Transportation. Seriously, just buy a soda if you aren't super hungry. This is a local business you can feel good about supporting. 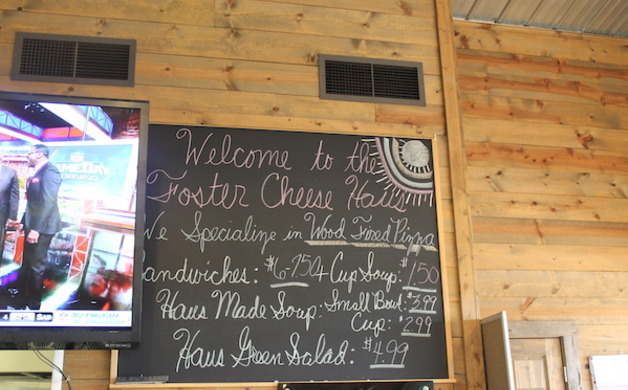 ANYWAY, as it turns out, Foster Cheese Haus specializes in wood fired pizza, sandwiches, delicious salads, soups, and the best desserts and deli options I've ever encountered just about anywhere in Wisconsin. 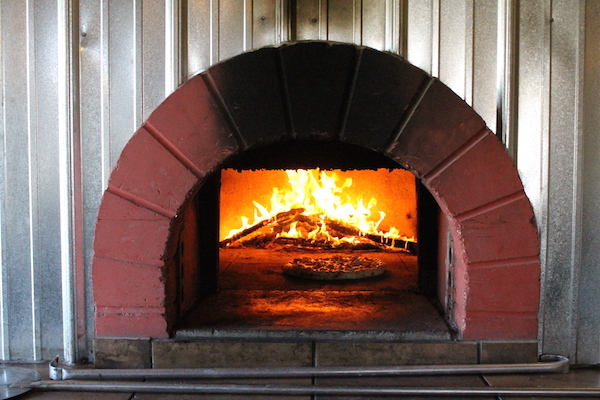 Everything is made from scratch, from the bread to the crackers and the herbs picked fresh from the gardens around the building. 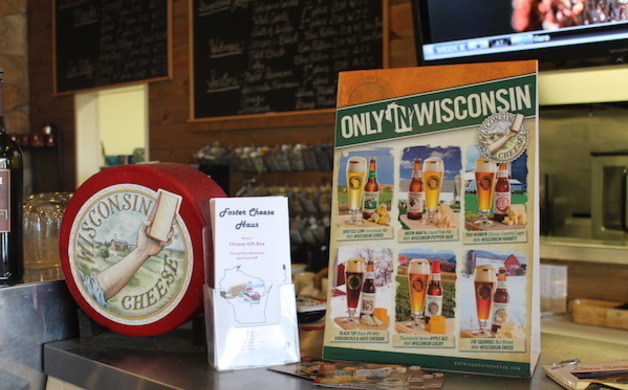 Not that I advocate drinking and driving, but Foster Cheese Haus also has a wine menu, local beer on tap, AND a beer cave. If you want to hang out for a bit, you'll find indoor and outdoor seating (weather permitting). While I have never ordered the wood fired pizza, I did capture this shot of someone's meal roasting in the oven located just off the dining room (Foster's also has a mobile pizza oven located in a refurbished/re-purposed fire truck). I once saw a sign advocating advance dining reservations if you plan on visiting on a weekend evening; check the website for information on live music or other events or happenings. 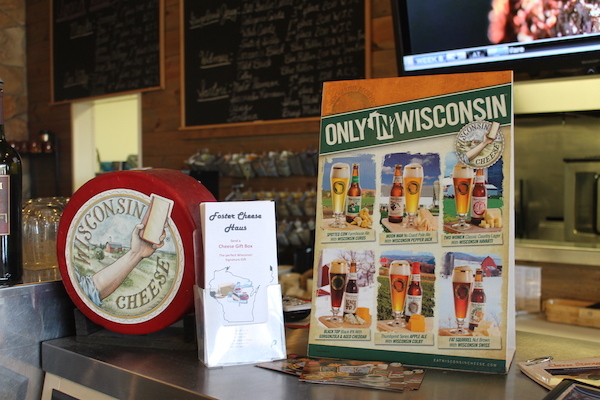 Obviously, you'll find a wide variety of Wisconsin cheese, meats, honey, and breads in the retail area. One of my favorite "thank you" gifts to send people is Castle Rock Organic Cheese Curds and anything gouda (Have a Gouda Day!). Fosters Cheese Haus has helped me send cheese care packs to Texas, Michigan, Kentucky, and Montana—the customer service is fabulous and I know my shipment is always timed with the freshest batch of cheese. This post is not sponsored, endorsed, or influenced by anyone. I like cheese and Fosters Cheese Haus has always been good to me. 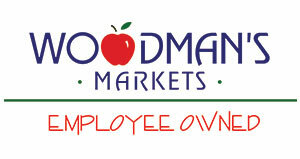 Thanks for keeping your cheese fresh and your restrooms clean!